For Mike Heller of the Mount Angel-based Kraemer’s Nursery — and for probably just about any other seasoned nursery grower out there — the key to success can be boiled down to three simple things. Of course, there’s plenty of complexity behind that simple summation, but those three factors, if tended to properly, can spell success or failure for any nursery. And nowhere are space, time and money more crucial than when it comes to managing — and optimizing — production cycles. Nurseries large and small must constantly monitor and tweak their production cycles to make sure that what they’re putting into the ground — or pots — balances with what they get out of it. The shorter the growing cycle, the quicker the return on investment and the sooner the next crop can be planted. But a rainy spring or a frigid winter can throw in a wrench, and ongoing labor shortages always add a hint of uncertainty. Longtime growers have developed their own effective approaches over the years, and new technologies, including mechanization and advances in fertilizers, insecticides and fungicides, are helping to tighten up cycles even more. It’s all part of the ongoing odyssey that every nursery is on. When it comes down to it, there is a real science behind nursery growing cycles. A plant goes in the ground or in a pot and, if all goes as planned, comes out a certain number of months or years later, ready for sale and shipment. Along the way, it requires attention, as well as resources, to ensure it emerges in the best possible condition for the least possible input. Todd Nelson, with the Woodburn nursery Bountiful Farms, said the goal is to have production cycles be as exact and steady as possible. Anything less can lead to underwhelming and unprofitable results. And the more variables that arise along the way, the more challenging it will be to keep the cycle steady. Along the way, however, challenges and obstacles are bound to sprout up. 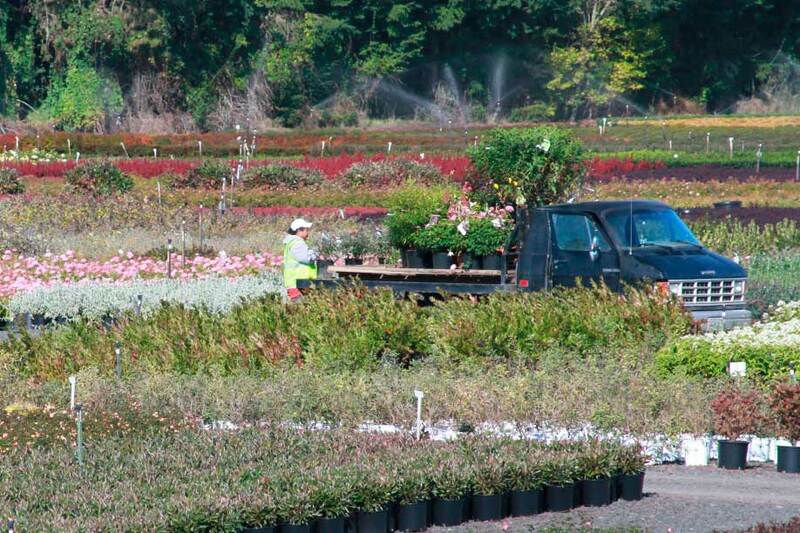 One of the biggest is an issue that seems to shadow every aspect of the nursery business: labor. An ongoing shortage of labor in the industry has made it hard for nurseries to find the workers they need to help ensure that their operations can run smoothly and efficiently. Balancing spacing and timing of production can be tricky, and any deviation can mean plants need more handling than initially planned for. One example from Lee is that a certain crop may need to be planted in June for a finish by September. If there’s not enough space, the plants could be put down pot-to-pot. That reduces the amount of water they need, but it also requires more labor time when they need to be spaced as they mature. Weather, naturally, also has a big hand in how production cycles unfold over the seasons and turn it into more of a gamble. “Mother Nature is always throwing curveballs at you,” Heller said. Considering the challenges and limitations, growers have, nonetheless, found ways to keep their growing cycles short, sweet and productive. Heller said Kraemer’s has developed its approaches over years and years of examining how different plants grow best, when demand peaks and other factors. The nursery also works closely with its sales team to develop a forecast of what customers want and when, and then proceed accordingly. He said Kraemer’s essentially has a “recipe” for each plant. Nelson, too, said that years in the business have helped Bountiful Farms hone in on the best schedules for pruning, fertilizing and taking other steps to keep production cycles as smooth and short as possible. And Lee said that, in addition to experimenting with planting dates, fertilizing rates and forcing plants under plastic, making sure that labor is as efficient as it can be when tending to plants is key. The ever-changing world of fertilizers, insecticides, fungicides and new varieties is also an important one to pay attention to. Heller said he is constantly monitoring the marketplace and communicating with other growers across the nation to keep up on what’s new and what might be available to help optimize a production cycle. Just as advances have been made in amendments and varieties, so too have technology and mechanization come a long way in helping growers maximize their yields and investments. “We are mechanizing wherever we can,” said David Van Essen, owner of Van Essen Nursery Company in Lebanon, Oregon. For Heller and Kraemer’s, that’s included investing in a drone to monitor crops. Nelson said Bountiful Farms uses robots at its operation, as well as a Trimble GPS system that can help with spraying, water management, yield monitoring and other processes. This year, Eshraghi Nursery introduced more automation into its pruning, staking and planting procedures, and according to Lee, it has already made a noticeable difference. And technology doesn’t have to just mean drones and robots. Heller said advanced software tracking systems alone have been a huge help at Kraemer’s. Keeping production cycles as tight as possible while still maintaining quality can help nursery growers maximize their investment — and their return. And while much of the required expertise is developed in the field and after years of experience, a little classroom time and some continuing education never hurts, either. For those growers who are in the greenhouse production realm, the University of Florida Institute of Food and Agricultural Sciences is offering just the course. Conducted entirely online from Oct. 30 to Dec. 1, 2017, UF’s Costing and Profitability course will offer a range of topic areas to help growers develop the skills they need to accurately estimate production cost and profit for their businesses. Those topic areas include everything from crop enterprise budgets and preparing income statement data to allocating overhead, labor cost and efficiency and price and profitability. The course also takes on seasonality, space use and shrinkage and how to maximize return on investment in technologies. Instructors include Paul Fisher, Ph.D., Alan Hodges, Ph.D., Rosanna Freyre, Ph.D. and Bill Swanekamp of the wholesale grower Kube-Pak. There’s likely more new technology and automation on its way to help growers continue to maximize their output while trimming their input. Production cycles will always be limited by plants’ natural growth patterns, but that doesn’t mean that nurseries everywhere won’t stop advancing their efforts to increase quality, improve profitability and get their leafy products out to those who want them — whenever they want them.